There's nowhere to go but up for Desna and her crew. 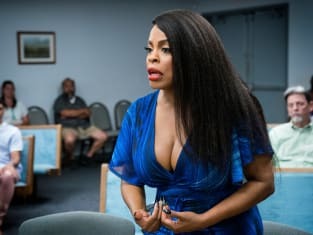 Everything fell apart, strangely except for Jenn and Bryce, on Claws Season 2 Episode 8. It's clear that Desna will do almost anything to avoid ending up in prison. Desna feels that everything she's done is to protect Dean and her crew. She really believes that. If this episode proved nothing else, it's that Desna's crew needs her, as most were blind to what was happening around them. But Dean may be able to stand on his own, supported by Virginia, of all people. Is it possible that, like Roller, she is actually maturing? I'm saying she's doing so slowly, ever so slowly. Dean was right when he said that everyone around him, including Desna, are making the wrong choices, if for the right reasons. Desna just started out laundering money for a little supplemental income, for her and her girls. That way, she could move up, to a bigger salon and a cleaner house for she and Dean. She has been using questionable methods to reach admirable goals. Dean has always been her moral compass, but she has been ignoring him too much lately. She's been being wooed both by Gregory and Zlata, and she likes her new lifestyle, enough that she's willing to overlook the whole, you know, illegality with which she's involved. This also means that she missed a lot of warning signs about what's happening in the lives of those most important to her. She's juggling too many balls. First, Quiet Ann walked away. And now Dean is leaving Desna as well, in part to protect himself and Virginia from the mess in which Desna finds herself. Desna's brief stay in jail seemed to serve as a wakeup call, just like she had after discovering Gregory and Zlata betrayed her. Desna started acting rather than reacting, putting her contingency plans into action. It was good to see Mandy the Realtor again. And, no, it wasn't surprising to see she had gotten addicted to cocaine and was kiting checks as a result. I truly was afraid that Mandy was wired by the police to get incriminating evidence from Desna. But it appeared that she was just another lost soul, like Desna, who ended up in jail. Poor Dean was trying to do things the right way, at least as he had learned from TV when he took the paper bag of tip he earned from dancing to the police station to bail out Desna. Fortunately, the desk sergeant gave him the bum's rush before Dean could accidentally get Desna in more trouble. Of course, Zlata found out that Desna had been arrested and bailed her out. Now that she was sure Gregory would be coming after her, she needed allies, even if Desna was initially meant just to be her stooge. And Desna needed someone with deep pockets to get her free. Desna's plan of planting cocaine on Boris actually worked, as Zlata and Gregory were now plotting against each other. Desna remained in a position to take advantage of that if she's really, really careful. One unexpected side benefit of her plan was that Uncle Daddy got back together with his Dixie Mafia cohorts, blaming the Russians for killing their boss, Ted, which Bryce actually did on Claws Season 1 Episode 9. It wasn't a promising development for Desna, as it's unlikely that Clay and his fellow rednecks will continue their alliance with a black woman. Now's let turn to the breakups among Desna's crew. It was likely that Polly would figure out what Ken was doing. But I thought she would piece it together in time to use it to Desna's advantage, not afterward when it was too late. Polly was right to break up with Ken. But her heartache isn't over yet, as it seems like Marnie is ready to go back with her "reformed addict" mom. I felt worse, however, for Quiet Ann, who ultimately but accidentally betrayed Desna. By pouring out her soul to Arlene, she gave her at least some of the evidence she needed to arrest Desna. On the other side, Jenn and Bryce have gotten back together. But of course, it wasn't that simple. 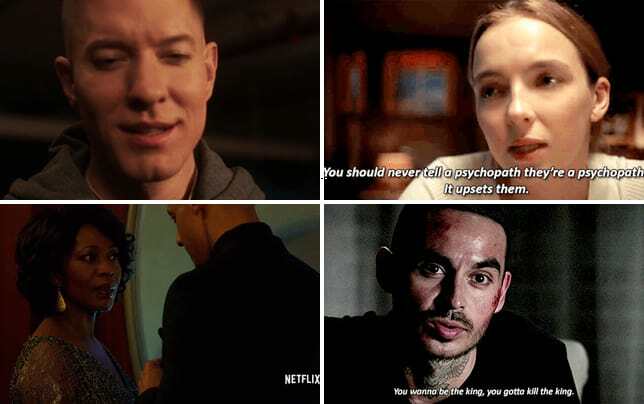 Instead, Hank, the nice guy on Claws, had to be turned into a psycho stalker. Bryce's hallucination, in which his Tony Robbins-style presentation was interrupted by Hank promising to resume his affair with Jenn, was amusing, illustrating his internal fears. The whole rescue, with a drugged Bryce limping across town to save Jenn just before the cops arrived, was totally implausible. So what's next? Desna has made a deal with the devil, Zlata, in which Gregory gets killed after marrying Desna in exchange for Desna opening three more clinics. I don't see how Desna is going to come out of this with herself, Dean and her crew unscathed. Flipping in return for immunity would have been a safer option. To follow Desna's dangerous path, watch Claws online. How does Desna get out of this mess? Will someone not survive this season? Who ends up on top? Comment below.